Minecraft Seeds Pro has been updated! On-sale now! 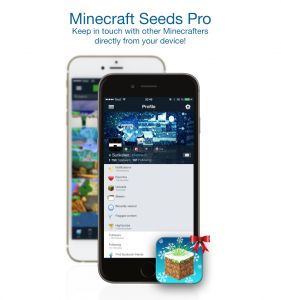 Minecraft Seeds Pro – the best seed-sharing app ever developed – has just received a massive update. Even better, it’s $1.99 instead of $2.99 from today (it’s Christmas Eve in case you didn’t know), until the 29th of December! Group PM, stay in touch with ALL your Minecraft friends directly through private messaging in the app! Follow your friends and let them follow you and you can PM each other directly and instantly directly from the app, without exchanging numbers or anything! Up to 10 users can PM in the same group! Browse through thousands of awesome seeds and creations posted by other users! Get featured with your own! Share your creations, post your favourite seeds and discuss cool forum topics with other Minecrafters. Connect and play with other players! Get followed / follower others to stay updated on new awesome content posted by other users. Customise your avatar and profile to your liking! The sale will be at 30% going from $2.99 to $1.99 – it’ll start the 24th of December and continue to the 29th. You are currently reading Minecraft Seeds Pro がアップデート！ at minecraft.ologies.net.